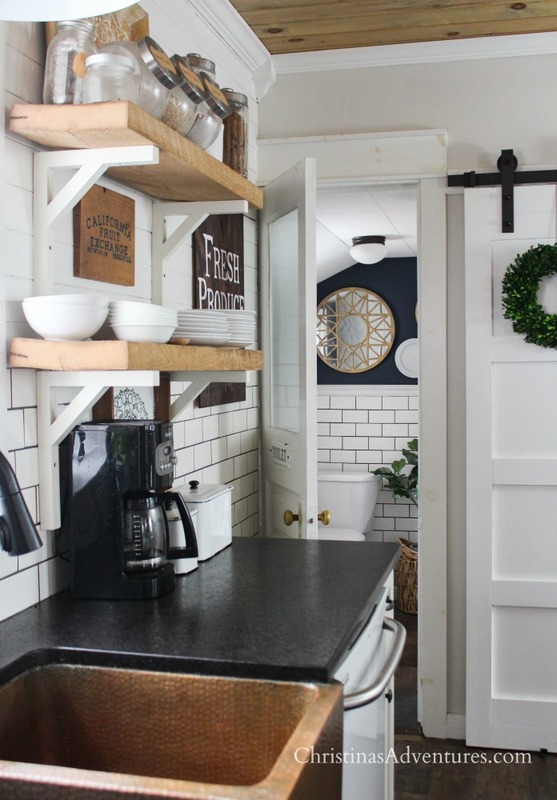 Great tutorial for how to make this DIY sliding barn door – this one was used as a pantry door in a farmhouse kitchen. Affiliate links are included – full disclosure here. I get asked about our DIY sliding barn door in our kitchen almost every time that I post a kitchen picture on Instagram. I wasn’t going to write up a post about this door, but it seems like everyone would like to see how we made it! Here’s what we started with in our kitchen. We had a weird space that used to house the hearth for the home (way back in the day). We figured it could be a perfect little pantry. But instead of building a door, we realized this space would work well with a sliding barn door. We added some more drywall to the left side. When you’re planning out a sliding barn door installation, you need to make sure that it’s going to have enough room to slide all the way to the left and have the doorway be opened. So we needed to add a little bit of wall space to the left hand side so the door would fit. I went to ReStore and found an old hollow core door that fit the space. It was thinner and it was the right length – perfect! It was also $10, so that was even better. We then measured out the door, and divided it into four sections. We put wood on the door with nails and adhesive. I believe we used 1×4’s on the sides and the interior boards, and then doubled up those boards on the top and bottom to add some visual weight. Once the wood was adhered, I sanded, caulked and painted the wood. We needed our sliding door to clear the molding we had on the floor, so we put a piece of wood on the wall to bring the whole door out a bit. We did a lot of searching for the best price on barn door hardware, and this was by far the best price we found. It wasn’t the easiest to put together because the directions weren’t detailed, but it was worth the savings. We bought another style of barn door hardware by the same brand for our sliding door in our hallway. Now, here’s the tricky part, and why I almost didn’t write up this tutorial. The barn door hardware didn’t fit with the width of the extra wood on the door. My husband was not too happy when we figured this out. He ended up figuring out that he could make it work by “gouging” holes in the back of the door so the hardware could connect on either side. Phew. We realized too late that we probably should have used a drill bit like this and it would have been easier. I added a handle (from Home Depot…it was silver and I spray painted it matte black). Wouah ! C’est vraiment trop beau !! A faire dans notre maison ! sorry – to do that I’d have to take it off the track and it’s just not something I like to take off & on. If you get one of the drill bits that I linked to in the post, that will help to inset the screws into the door more. Hope that makes sense!